1. 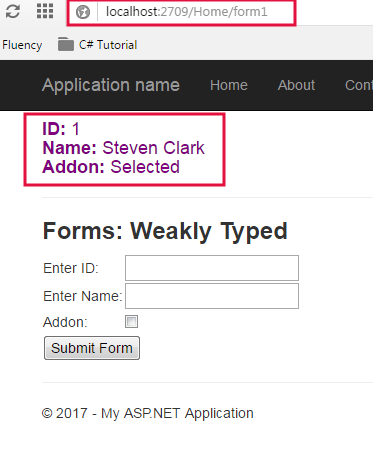 How to create Forms in ASP.NET MVC? 2. 4 Different ways to create MVC Forms. 3. How to access Forms data in controllers? Forms are very essential and basic thing that every programmer has to learn. 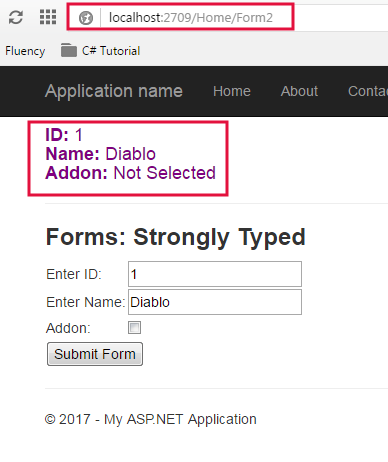 In this tutorial, I will teach you 4 Different Ways to Create ASP.NET MVC Forms with ease. 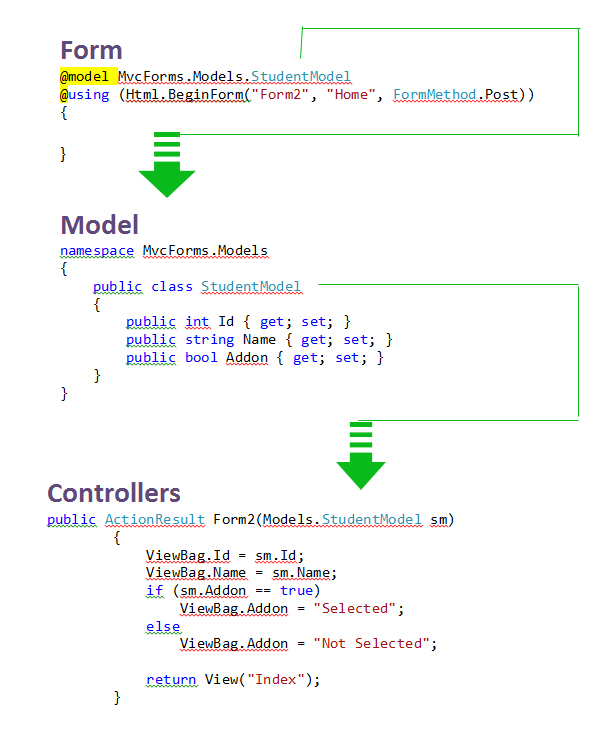 Step 1: Create a New ASP.NET MVC Project MvcForms. Go to File New Project. If you don’t know how to create a new mvc project then see this chapter. Step 2: Create a model class StudentModel.cs. Right-click on Model Add Class. Step 3: Open StudentModel.cs and add the following code in it. This is the easiest and quickest way to create forms in MVC. 1. Go to Views Home Index.cshtml and update it with following code. 1. In the <form action="form1" method=”post”>, form1 is Action Method that gets executed when forms sends data to HomeController using post method. 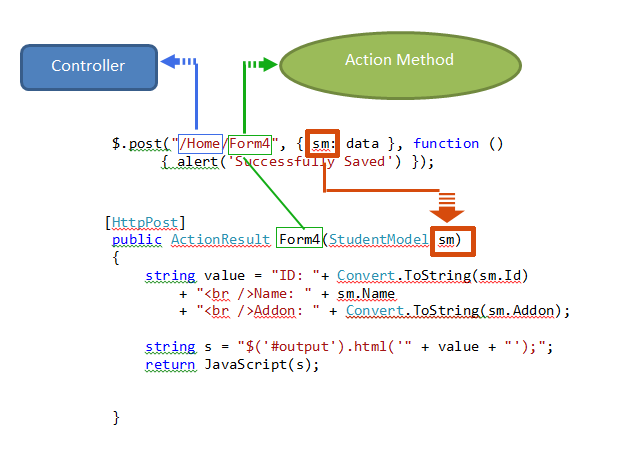 In the next chapter, you will learn about post and get method in mvc. 2. In the <input type="text" name="txtId" />, the property name=”txtId” must be same as parameter name in form 1 action method. 3. CheckBox sends "on" if it selected otherwise sends null. 2. Mostly used when you need to create a form with one or two input items. 1. Because, it is not strongly typed so IntelliSense doesn't help you. 2. Have higher chance of getting exception and runtime error messages. 3. Very difficult to manage when forms have multiple input items and controls. 4. It is very clumsy when you need to add or remove some input items. In this method, we send objects (model) instead of sending each item as parameter. It is easy to maintain because you don't need to remember each input item and IntelliSense will show you automatically the each item. Step 1: Go to Index.cshtml and update the code like this. Step 2: Go to HomeController.cs and add the following action method. iii. FormMethod.Post: It denotes that all the data will be submitted to controller using Post method. iv. @Html.TextBoxFor(m => m.Id) This is Html Helper. I have created textbox using mvc htmo helper and it is strongly bounded with Id. v. m => m.Id is a lambda expression. It means that m is an instance of StudentModel. In this Action Method, I have passed the object of StudentModel class. Asynchronous AJAX form is a very magical way to submit data to the controller without happening page load. Asynchronous AJAX Forms simply post back the data to the controllers and update the only that part of the page, which has to display output. 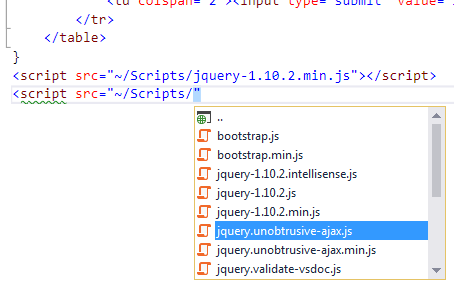 Step 2: Go to Browse and search for ajax. 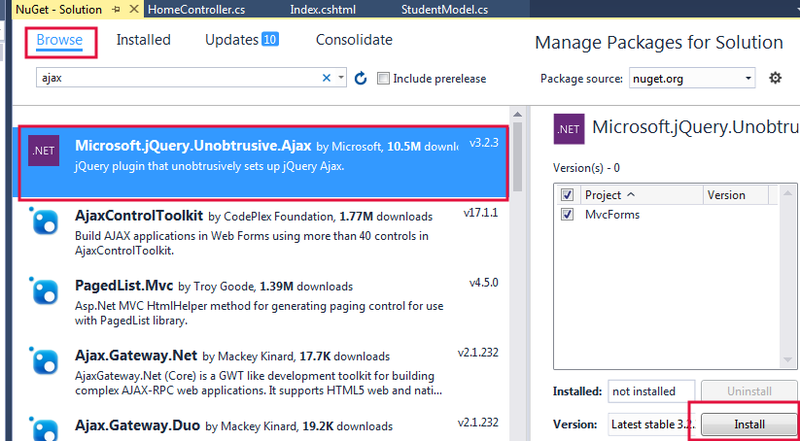 Find and Install Microsoft-JQuery-Unobstrusive-Ajax. Step 3: After installing this you can see it in Script folder. 1. Add these two scripts in the project. 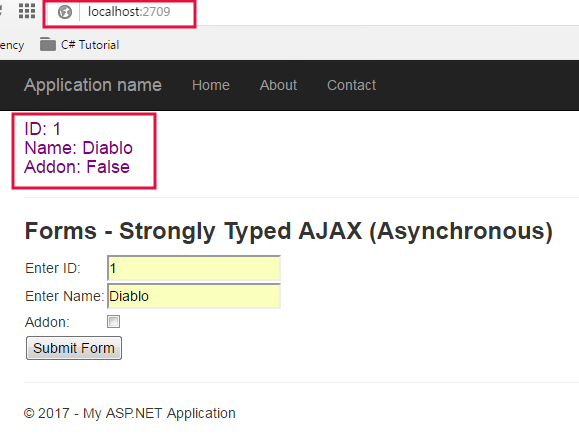 a. Ajax.BeginForm is used for creating Asynchronous AJAX Forms. b. Form3 is an Action method. c. Home is a Controller name. d. HttpMethod = “POST” denotes that data will be sent to server using POST method. e. UpdateTargetId updates the area which will get updated and display output. In my program, <h4 id="id1" style="color:purple"></h4> will be updated and display output. f. LoadingElementId display the loading image or loading message meanwhile AJAX is posting and retrieving data from models or controllers. g. OnSuccess works when task completed successfully. h. OnFailure works when task gets failed. Step 2: Go to HomeController and add the following action method. In this method, you can not only send data from input controls but can also use html elements like <p>…</p>, <span>…</span> to send data to controllers. 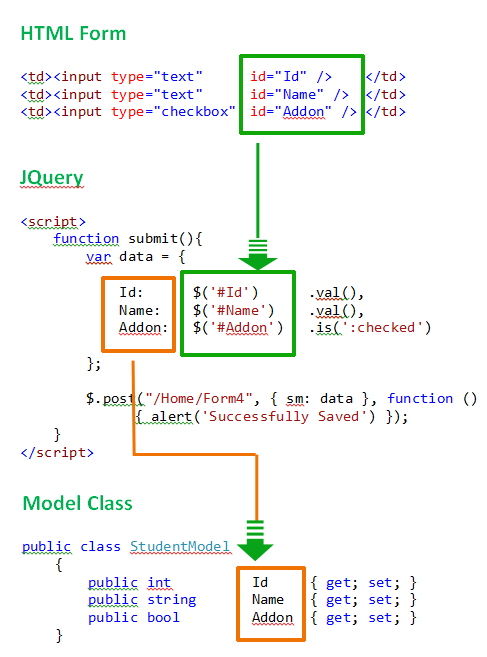 This is pure JQuery and AJAX query. Step 1. Go to Index.cshtml and create form like this. Step 2: Go to HomeController and add following action method. 1. Created a form using pure html control and call a submit() function in button onclick event. 2. Must map the variable and member according to your models and controllers member. See the picture below. 3. $.post() method post form data to controller. a. /Home/Form4 - Home is controller name and Form4 is an action method. b. sm: data – sm is an object of StudenModel in Form4 Action Method. In this tutorial, you learned 4 different ways to create form and submit data to the controller. 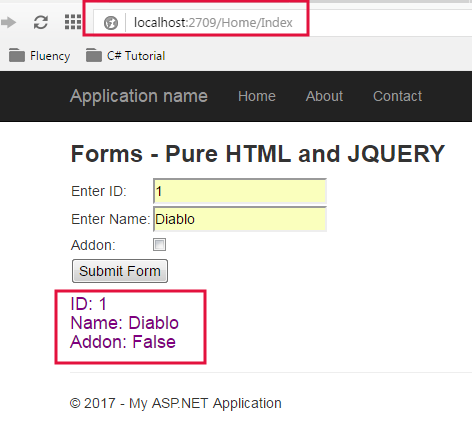 All these 4 ways used widely in MVC and I hope now you will be able to create a form in ASP.NET MVC. In the next chapter, you will learn FormCollection object in details with programming example. FormCollection objects make a job much easier when collecting form data into the controller.